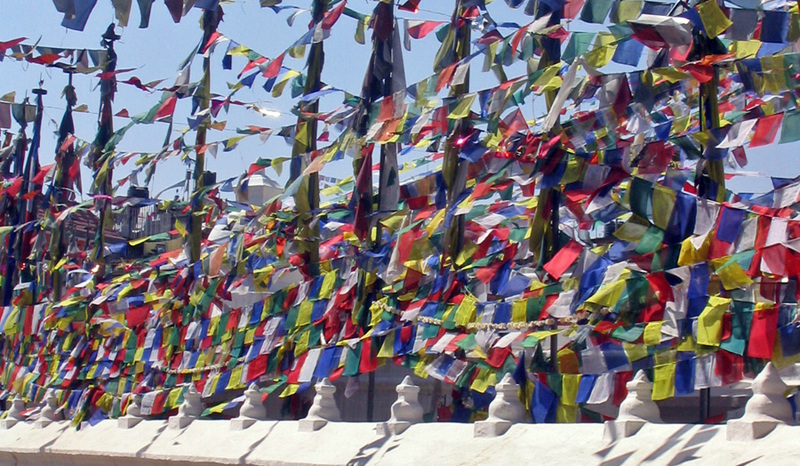 Prayer flags originated from the Yungdrung Bön tradition. Upon them are written prayers and mantra to increase good health, long life, wealth, and harmony. They are of the colors of the building blocks of the universe: the five elements. White=Space, Green=Air, Red=Fire, Blue=Water, Yellow=Earth. It is believed that the wind activates these prayers and mantras and that both the environment and the beings within it are blessed. Posted on January 22, 2013, in Prayer and Ritual, Uncategorized and tagged Asian studies, Buddhism, prayer, prayer flags, sacred, sacred art, spirituality, tibet, yungdrung bon. Bookmark the permalink. Leave a comment.